People visiting the March Greater Atlanta Coin Show enjoyed a nice day outside and a busy bourse filled with a variety of numismatics and other treasures inside. Here's a big THANK YOU to all of the dealers and all of the visitors for coming to the coin show. Dealers filled the bourse's tables with collections of coins, currency and bullion from the ancient era to the modern day, and people filled the aisles browsing, buying, selling or trading. Outside, weather.com predicted 100% rain, which, I suppose they were right in that it rained in the early morning, however for the majority of the day we appreciated nice, warm pre-spring weather with a mix of sunshine and clouds. This month, the hotel was busy too. Next door to the coin show, a church held their services. During the day, people caught glimpses of young people in formal attire. People speculated they were learning how to dress, behave and attend a formal function. Oh, and the hotel hurried us out of our room such that they could prepare for a fancy birthday party in the evening. No, we don't know who was celebrating. Visitors to the show also saw the yellow cordoned area around a big hardwood cut into pieces near the Brumby house. Not sure if the tree fell or if they took it down due to disease. As for visitors to the bourse, several searched for bullion coins and collectibles. As just one example, a person was selling one type of numismatic collectible such that he could buy gold. And, speaking of bullion, one of the dealers offered several of the "hockey pucks" in his showcases. "What is a hockey puck?" you ask. Well, a real, regulation hockey puck is three inches in diameter, one-inch thick and weighs between 5.5 and six ounces. Do people want to collect a three-inch coin? Perhaps more time is needed to determine any collectible value above their precious metal value. Another oddity on this month's bourse was a collection of Third Reich medals, badges, pins and ribbons. A quick search on Google shows quite a number and variety of Third Reich Militaria - original, reproduction, and in all likelihood, counterfeit as well. It's wise to see the actual medals, badges, pins and ribbons, and discuss them with a reputable dealer. The numismatic "hockey puck" is an America the Beautiful five-ounce silver coin that is three inches in diameter. It's not one-inch thick like a regulation hockey puck, but its diameter and weight is close enough to be affectionately called a "hockey puck." Yes, the first year of the large bullion coins was 2010, but the first fiscal year for the coins was 2011. Now, some of these "hockey pucks" have become difficult to find because of their low mintages. In particular, some of the ones the dealer had on display have become difficult to find. The mintages can be found on the US Mint's website, however those items still for sale, such as some of the 2015 and the 2016 coins, do not have quantities finalized yet. Looking at the overall totals above, the 2012 should be more rare, but be careful. The comparison is apples and oranges. The US Mint's mintage numbers are fiscal year whereas the individual coin mintages are for the coin's mint year. Though, looking at the individual coins, the 2012 "hockey pucks" do have low total mintages - low 20,000s for the bullion and mid to upper 10,000s for the numismatic coins. But, do the "hockey pucks" have collectible value impacted by their rarity or do they follow silver bullion prices? In addition to those collectibles, Luftwaffe Reconnaissance Awards were also on the bourse. The Luftwaffe presented a variety of awards with different designs indicate the different achievements. An arrow pointing upward inside the central wreath indicates an award for Short Range Day Fighters. The downward pointing winged bomb inside the wreath denotes the award for the crews of Heavy, Medium and Dive Bombers. An eagle's head facing to the right inside the central wreath identifies the award to Reconnaissance, Air-Sea Rescue and Meteorological flyers. As the war progressed and operational flights quickly exceeded the 110 represented by a Gold award, the Luftwaffe enhanced their badges to recognize greater achievements. Other badge changes became necessary as time passed. The Third Reich Militaria and US Militaria from this period help us remember a terrible period of our history and honor those who fought. That's it for this month. The bourse, of course, included many numismatic items in addition to these "oddities." 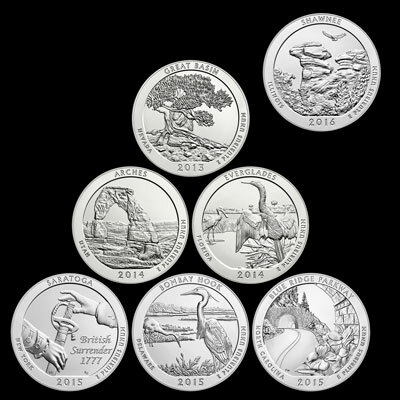 "The US Mint produces the America the Beautiful 5-ounce silver coins in bullion and numismatic versions. The bullion version, which lacks the 'P' mintmark, has a brilliant Uncirculated finish and is sold only through dealers. The numismatic version, with the mintmark, has a matte or burnished finish (although it is not marketed by the Mint as 'Burnished'). These coins, designated Specimens (SP) by grading services, are sold directly to the public." Next time, the bourse will showcase a wide variety of coins, currency and bullion items, along with collectibles such as medals, gemstones, stock certificates and other treasures. Mark your calendars and join us for the next monthly coin show on Sunday, April 10, 2016.